Our Northern Kentucky dog boarding and doggie daycare facility is setting a new standard for dog care. 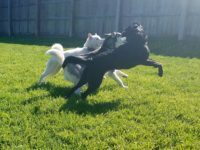 Check out this video of some of the dogs in our dog boarding and daycare programs playing and having a great time! New Beginnings is not a traditional doggy daycare and dog boarding kennel. We pride ourselves in having a unique all-inclusive priced service that includes a full day schedule of rotation of indoor and outdoor play time balanced with an equal time of rest periods, potty breaks, medication administration, feeding, stuffed kongs and good-all around loving care. No hidden fees or al-la-carte charges. It is our standard of care. Find out more here.